Micromachining Mold Inserts Modern Machine Shop 69 help ensure concentricity, cause even wear and support the f lushing process. Angelo Quadroni, Sarix CEO, says a special feature of the company's technology is that this tool is produced on the machine itself. 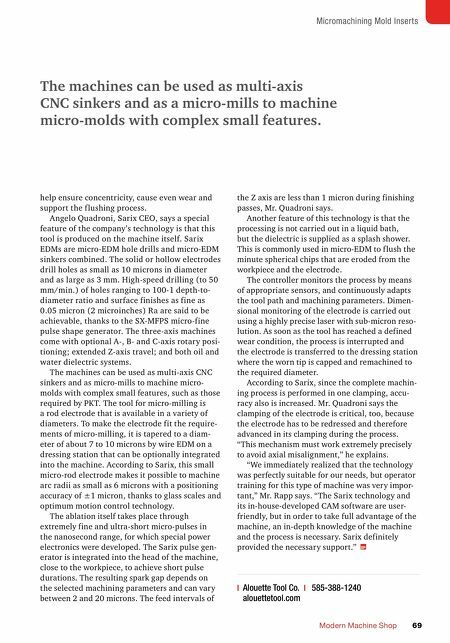 Sarix EDMs are micro-EDM hole drills and micro-EDM sinkers combined. The solid or hollow electrodes drill holes as small as 10 microns in diameter and as large as 3 mm. High-speed drilling (to 50 mm/min.) of holes ranging to 100-1 depth-to- diameter ratio and surface finishes as fine as 0.05 micron (2 microinches) Ra are said to be achievable, thanks to the SX-MFPS micro-fine pulse shape generator. The three-axis machines come with optional A-, B- and C-axis rotary posi- tioning; extended Z-axis travel; and both oil and water dielectric systems. The machines can be used as multi-axis CNC sinkers and as micro-mills to machine micro- molds with complex small features, such as those required by PKT. 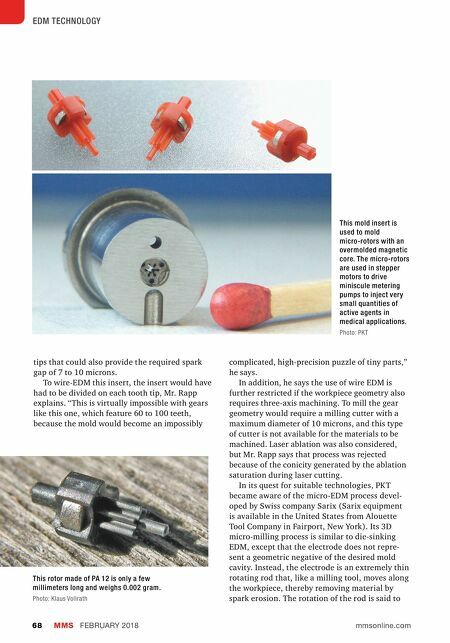 The tool for micro-milling is a rod electrode that is available in a variety of diameters. To make the electrode fit the require- ments of micro-milling, it is tapered to a diam- eter of about 7 to 10 microns by wire EDM on a dressing station that can be optionally integrated into the machine. According to Sarix, this small micro-rod electrode makes it possible to machine arc radii as small as 6 microns with a positioning accuracy of ±1 micron, thanks to glass scales and optimum motion control technology. The ablation itself takes place through extremely fine and ultra-short micro-pulses in the nanosecond range, for which special power electronics were developed. The Sarix pulse gen- erator is integrated into the head of the machine, close to the workpiece, to achieve short pulse durations. The resulting spark gap depends on the selected machining parameters and can vary between 2 and 20 microns. The feed intervals of the Z axis are less than 1 micron during finishing passes, Mr. Quadroni says. Another feature of this technology is that the processing is not carried out in a liquid bath, but the dielectric is supplied as a splash shower. This is commonly used in micro-EDM to f lush the minute spherical chips that are eroded from the workpiece and the electrode. The controller monitors the process by means of appropriate sensors, and continuously adapts the tool path and machining parameters. Dimen- sional monitoring of the electrode is carried out using a highly precise laser with sub-micron reso- lution. As soon as the tool has reached a defined wear condition, the process is interrupted and the electrode is transferred to the dressing station where the worn tip is capped and remachined to the required diameter. According to Sarix, since the complete machin- ing process is performed in one clamping, accu- racy also is increased. Mr. Quadroni says the clamping of the electrode is critical, too, because the electrode has to be redressed and therefore advanced in its clamping during the process. "This mechanism must work extremely precisely to avoid axial misalignment," he explains. "We immediately realized that the technology was perfectly suitable for our needs, but operator training for this type of machine was very impor- tant," Mr. Rapp says. "The Sarix technology and its in-house-developed CAM software are user- friendly, but in order to take full advantage of the machine, an in-depth knowledge of the machine and the process is necessary. Sarix definitely provided the necessary support." | Alouette Tool Co. | 585-388-1240 alouettetool.com The machines can be used as multi-axis CNC sinkers and as a micro-mills to machine micro-molds with complex small features.